The Kawasaki 1400GTR, also known as the Concours 14 or ZG1400 in some markets, is a sport touring motorcycle produced by Kawasaki. The 1400GTR was introduced in September 2007 and is based on the ZX-14 platform. It replaces the original GTR1000 (Concours), which was built from 1986 to 2006. The American model name "Concours" is derived from a gathering of prestigious vehicles in a contest of elegance, such as the French Concours d'Elegance and is pronounced with a silent s, /kawn-koor/. The engine is a transverse-mounted 16-valve inline-four with a displacement of 1,352 cc (82.5 cu in). It has variable valve timing, derived from a Mitsubishi Motors car engine, which allows the phasing of the intake camshaft to be advanced by up to 24°. This continuous alteration happens progressively as the rpm rise and fall. The fuel injected engine on the 2008 and 2009 models has a power output of 114 kW (153 hp) at 8,800 rpm and produces torque of 136 N⋅m (100 lbf⋅ft) at 6,200 rpm. The ram-air intake increases power to 117.6 kW (157.7 hp). The bike's rear suspension-drive system is known as Tetra-Lever and is similar to the BMW Paralever and Moto Guzzi CARC systems. It is designed to handle the conflicting drive and suspension forces (known as shaft effect) typical when shaft-driven motorcycles carry powerful engines. Both the original Concours and the Concour 14 have a slipper clutch that lets the rear wheel freewheel to lessen the risk of sliding when the rider uses excessive engine braking. The 1400GTR is fitted with a keyless ignition, KIPASS (Kawasaki's Intelligent Proximity Activation Start System), which means that no key is needed to start the bike as long as the rider is carrying the coded transponder—typically in a pocket. From launch the 1400GTR had the option of an anti-lock braking system (ABS). In 2010, Kawasaki added KTRC, a traction control system, and replaced the previous ABS systems with K-ACT (Kawasaki Advanced Coactive-braking Technology), an improved system with power-assisted brake force redistribution.K-ACT is also a combined braking system in which both the front and rear brakes are applied in differing amounts depending on whether the front brake lever or rear brake pedal is used. The rider is able to select, using a handlebar switch, the amount of front brake force applied when the rear brake pedal is used. The traction control uses the ABS sensors to detect when the front and rear wheel speeds differ—reducing rear wheel speed by telling the engine management system to reduce power output. Motorcycle Consumer News tested a 2011 Concours 14's top speed at 152.8 mph (245.9 km/h), and the bike's 0 to 1⁄4 mile (0.00 to 0.40 km) time at 10.56 seconds at 127.68 mph (205.48 km/h). They recorded a 0 to 60 mph (0 to 97 km/h) time of 2.91 seconds, and 0 to 100 mph (0 to 161 km/h) of 6.56 seconds. With ABS enabled they achieved a 60 to 0 mph (97 to 0 km/h) braking distance of 127.8 ft (39.0 m). With 135.61 hp (101.12 kW) at 8,750 rpm and a wet weight of 695.5 lb (315.5 kg), the power to weight ratio is 1:5.12. The 2008 model year was launched in late 2007. For 2010, Kawasaki made significant revisions including adding KTRC traction control and K-ACT ABS and brake assist, as well as linked brakes which are optional in some markets and standard in others. The 2010 model has revised bodywork to improve engine cooling and reduce engine heat to the rider, mirrors raised by 40 mm (1.6 in), the dashbord top was redesigned with vents to help relieve back pressure, a larger wind screen and with memory function and auto-lowering, a heat shield across the midsection of the exhaust pipe, a handlebar-mounted switch to control the dash computer, variable heated grips, an optional "Fuel Economy Assistance Mode" that tells the ECU to use a leaner, more economical air-fuel ratio only selectable less than 6,000 rpm and road speed less than 80 mph (130 km/h), an "Economical Riding Indicator" was added to the dashboard. The tank-mounted storage area was removed and replaced with an auto-locking glove box in the left fairing, the exhaust silencer cap was changed, the two color seat was replaced a single color model, the instrument cluster illumination was changed from red to white, an ambient outdoor temperature display option was added to the computer display, included key sets were changed from two active fobs/keys to one active fob/key and one passive mini fob/key, the front fork fluid levels were increased by 25ml, and the oil pan was modified so that the drain plug faces forward instead of downward to prevent damage. The ECU was programmed to limit top speed to 154 mph. The rear pannier covers were fully painted (instead of leaving a black area at the bottom). Many people refer to the 2010+ models as the 2nd generation (or "Gen 2") of the C14. No significant changes were made between the 2010 and 2011 models, although ABS became standard. The front rotors were slightly redesigned. Starting with the 2012 model, the front rotors were changed slightly to have a smaller carrier to resist warping and Kawasaki started painting the wheels black instead of silver. In 2014 the tire pressure sensors were redesigned with "potted" circuit boards, making battery replacement impractical. In some countries the 1400GTR is used by police and ambulance services, although this is not factory-built by Kawasaki as an authorities machine, rather it is a local conversion. ^ a b c "2008 Concours 14 First Ride" (PDF). Bikeland. 23 June 2007. Retrieved 14 April 2010. ^ "2015 Kawasaki Concours 14 ABS – Road Test Review". Rider Magazine. 12 December 2014. Archived from the original on 21 December 2014. Retrieved 21 December 2014. ^ "Concours". Dictionary.com. Retrieved 21 December 2014. ^ a b Searle, Dave (September 2007). "First Impression: 2008 Kawasaki Concours 14" (PDF). Motorcycle Consumer News. ISSN 1073-9408. ^ Ash, Kevin (7 July 2007). "Kawasaki 1400GTR: In for the long haul". Daily Telegraph. Retrieved 15 April 2010. ^ a b Ash, Kevin (7 April 2010). "Kawasaki 1400GTR review". Daily Telegraph. Retrieved 14 April 2010. ^ a b Brissette, Pete (29 October 2009). "2010 Kawasaki Concours 14 Review - The People's new Connie!". Motorcycle.com. Retrieved 15 April 2010. ^ "Best Sport-Tourer: Kawasaki Concours 14; Ten Best Motorcycles of 2008". Cycle World. July 5, 2008. ^ "Best Sport-Tourer: Kawasaki Concours 14; Ten Best Motorcycles of 2009". Cycle World. July 31, 2009. ^ "2008 Motorcycle Of The Year BEST TOURING BIKE". Motorcyclist. February 2009. ISSN 0027-2205. Retrieved 16 April 2010. ^ "2009 Motorcycle of the Year 2 Best Touring Bike". Motorcyclist. September 2009. ISSN 0027-2205. Retrieved 16 April 2010. ^ "Best Sport-Touring Bike: Kawasaki Concours 14". Cycle World. July 15, 2010. ^ "BMW K1300S vs. Honda VFR1200F vs. Kawasaki Concours14 vs. Triumph Sprint GT | MC COMPARO". Motorcyclist. March 15, 2011. ^ "KAWASAKI 1400GTR Overt Police Conversion". Woodway Engineering. Archived from the original on 24 October 2011. Retrieved 15 May 2010. ^ "Kawasaki Police 14 Enforcer" (PDF). Wattco. Archived from the original (PDF) on 7 July 2011. Retrieved 15 May 2010. 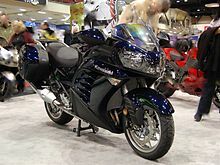 Wikimedia Commons has media related to Kawasaki 1400GTR.